Happy New it's time to celebrate! I am writing down my accomplishment for 2009: my small victories. I am rejoicing in them. I hope you are celebrating also. The pounds lost, the closet cleaned, the child off to college all of your wonderful accomplishment for 2009: celebrate them now. I keep a journal and tomorrow I will write all the things that a follow through with, refocus on what I missed and try to find the energy for the New Year. Before I say good bye to 2009 I want to say thank you. Im not sure why I started painting these small little adventures of bugs, dragonflies, and bumble bees but they seem to fit into these still lifes and give them a breath of life that I like. About This Painting: I started this painting about 3 months ago and life got in the way and it didn't get finished. So today I sat down and painted with out stopping until I had it completed. I have two areas in my studio where I paint. One is a flat table with really good light, this is where I do my watercolors. As they say oil and water do not mix, so I need to be far away form the oil paints and the brush must be sperated at all times. It is a nice mental break to change and paint in water color for a day or week. This painting is part of the year end challenge at Different Strokes from Different Folks. I painted her portrait from a picture sent to me by Karin Jurick's challenge blog called Different Strokes from Different Folks. Each artist sent Karin a photo of themselves. Karin then sent them out to other artists to paint. I had fun with this portrait, played with it a little it is not an exact likeness. There are paintings by 180 artist who participated in the event post at Different strokes, so take a look. I have found out that the painting was of Tracie Brown,. If you would like to see the painting she did of me please viste her blogTracy Brown. 12x10 oil on canvas mounted on hardboard ready to frame.This painting was done as part of the year end Portrait swapping challenge at Different Strokes from Different Folks. for all of you who have December Birthdays, Happy Birthday to you! About This Painting: It would not be Christmas with out several pots of Poinsettias around the house to make your spirits Merry. This is a watercolor painted on 140 lb cold press watercolor paper. I haven't painted one of these balancing acts for a few weeks so today I thought I would try some candy and added the bees for fun. Sweet little Candy Cane is here to brighten your day. About This Painting: I did the series of the 12 days of Christmas and I am adding a few new ones to the paintings I did last year. oil on stretched gallery wrapped canvas with painted sides ready to hang or it can be framed. About This Painting: This is my favorit Christmas candy that my father would give me every Christmas. 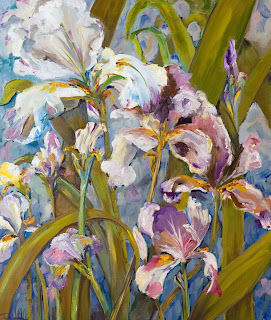 About This Painting: Like many oil painters I am heavily influenced by the post impressionist. I love the heavy brush work of Van Gogh and his subject matter but I am not fond of his palette of colors preferring the color of Cezanne. 24x20 oil on gallery wrapped stretched canvas with 1.5 inch painted sides. This painting may be hung as is or framed. About This Painting: Some people leave Santa milk and cookies, I feel Santa needs a little more cheer than that. So Santa I have been a very good little girl this year lets stop decorating the tree and have a little Christmas cheer to put that color back in the end of your nose. This painting is done in oils on canvas mounted on hardboard ready to frame.Paintings are shipped worldwide, personally packaged, and fully insured. Always signed by the Artist. 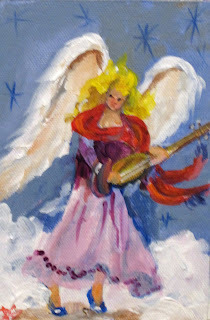 Angel No 9 , Musical Angle is 6x4 painted in oils on canvas mounted on hardboard ready to frame. 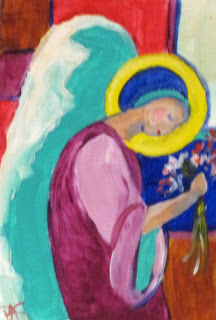 Angle with Flowers is painted in Acrylic on canvas mounted on hardboard 6x4 ready to frame. 8x6 oil on canvas mounted on hardwood ready to frame. 16x29 oil on gallery wrapped stretched canvas with painted sides. The back is wired and it may be hung as is or dress it up with a frame. 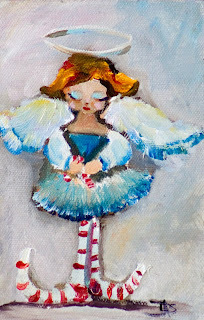 When I think of Christmas I think about peppermint candy.This is a sweet little painting to remind me of Christmas past. 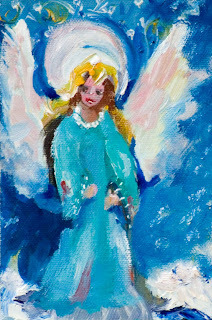 Miniture oil painting of an angle number six in the small series of angles for Christmas gifts. A little fruit and a little fun with buzzy bees and Dragonflies. The sides are painted and back the backis wired. It is ready to hang as is or it may be framed. What better Christmas gift than a sweet kiss. oil on gallery wrapped stretched canvas wired and ready to hang or it may be framed if you like. According to Greek legend, the first partridge appeared when Daedalus threw his nephew, Perdix, off a roof in a fit of jealous rage. 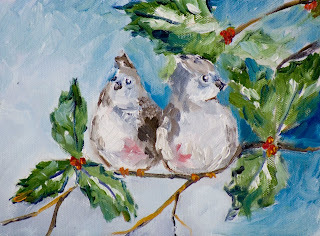 This painting is the first day of Christmas a Partridge in a Pear Tree painted in oils. There is heavy texture to this work and , yes those are little bees buzzing around the fruit tree. This painting has heavy impasto texture. 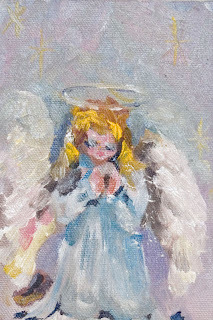 This the fourth in my series of small collectable Christmas Angles painted in oil. I sometimes like to take a break from the real world and paint a little fantasy or something whimsical. 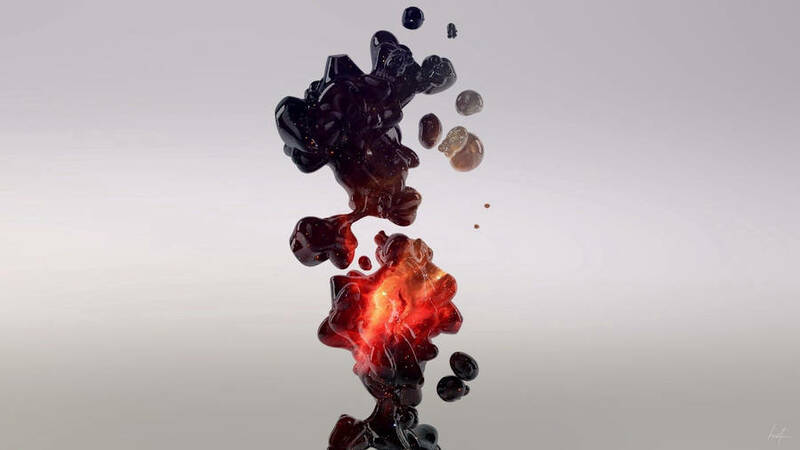 It gives my mind a little room to walk around on the wild side for the day. Today I am balancing some fruit. The little bees take a look to make sure I have done it correctly. 8x6 oil on gallery wrapped stretched canvas with painted sides. This is number 3 in the series of 14 Christmas Angles. When I was a child, my father had me go up a ladder in the barn and pull down sparrow nest. He did it so they would not build nests in the rafters of the barn. It was my spring job to keep all sparrows out of the barn. Dad said, "they could carry diseases to the animals. I've always look on sparrows as not so nice, but today looking out at the bird feeder as they jump around I don't have the same feelings but then I don't have a barn. Someday I will share my dream of a barn studio with you for now I just drive by old deserted barns and long for one of my own. Sparrows be ware. All good little kittens go to Heaven. This one is out ringing it's Christmas Bell for all the little kittens that need homes. This is number 2 in the series of 14 small Christmas Angles. I had a special request from a collector in Ice Land to another Conga Chickens. I thought for the next two weeks I would try to post an additional very small painting as well as my daily painting on my Painting of the Day blog. I'm not sure if I can keep it up but I will give it a try for two weeks. These are small and sweet for the Holidays, an early Merry Christmas.